Madison Campground is named for its proximity to the Madison River, which runs through the area in a lush mountain setting rich in wildlife. Madison Campground is at an elevation of 6,800′ and is set in a partly wooded area, with a variety of mostly sunny to mostly shaded sites. There are over 270 individual sites and 3 group sites. The campground can accommodate RVs and tents. 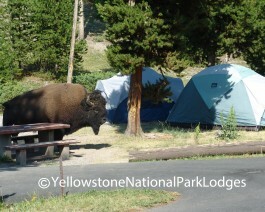 Campsites for hikers and cyclists are also available. Each site includes a picnic table and fire grate. Access to water is nearby the sites. Madison Campground has 14 public restrooms with flush toilets and faucets with cold running water. Dishwashing stations are available at the restroom buildings.